Environmental degradation in Latin America has become one of the most pressing issues on the international agenda. The volume began to crescendo when space shuttle astronauts photographed five thousand fires on a single night in the Brazilian Amazon state of Rondonia in 1985, and grew shrill when rubbertapper Chico Mendes was shot in 1988 trying to stop ranchers from clearing rainforests near his home in Acre. Since the early 80s, we've heard pleas from rock star, environmental groups, and scientists, asking us to focus our attention on environmental destruction in Latin America-oil spills, lax NAFTA driven ecological standards, endangered indigenous cultures, and the destruction of the rainforests. 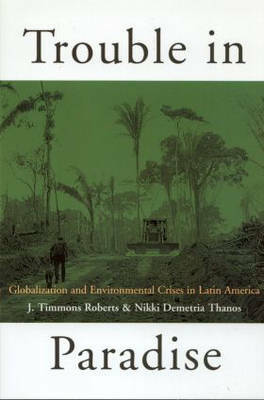 This volume presents an overview of the pressing nature of these issues and the scope of the problems and seeks to focus our attention on environmental destruction in Latin America by examining several types of environmental crises in Latin American countries. With discussions of the World Bank, urban pollution, NAFTA, toxic pollution in maquiladoras, headline grabbing environmental disasters, drug trafficking, and the 1992 Rio Earth Conference, this book will be a must read for anyone interested in the future of Latin America or world ecology.